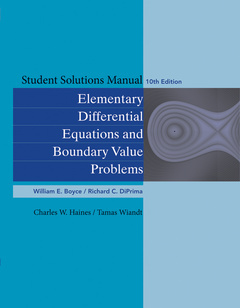 This is a Student Solutions Manual to accompany Boyce Elementary Differential Equations 10th Edition and Elementary Differential Equations with Boundary Value Problems 10th Edition. William E. Boyce received his B.A. degree in Mathematics from Rhodes College, and his M.S. and Ph.D. degrees in Mathematics from Carnegie–Mellon University. He is a member of the American Mathematical Society, the Mathematical Association of America, and the Society for Industrial and Applied Mathematics.